This 300sd has been on this dealer's lot for months, not selling. The dealer says they bought it for resale, 1 week later it wouldn't start. I looked in the pictures for a reason why. Take a look at the engine pictures, and the secondary fuel filter. Notice how it's ALL black gunk in there? You can't even see the strainer! They probably wore out the battery trying to crank it. Perhaps showing up with $500, a screwdriver, a secondary fuel filter, and a fresh battery would yield me a matching set of a Champaign Metallic 300cd and 300sd. Just an interesting thought. I would first suspect the glow plugs. If the filters are black it may need a boicide treatment for bacteria in the tank. It looks like a decent car. Could easily be something simple. Is the filter full of gunk or just the non-opaque variety? A 617 should start without glowing this time of year. The filter looks pretty "gunked" to me. Could be anything not making it start, though. I remember it was the winter when this was first posted, and they said a week after it stopped starting with a dead batt. Maybe the battery was getting old, bad alternator, something along those lines. I can't claim to have the best eyes but I still say that filter has a non see-through black case. Could be gunked up inside but I can't tell without cutting it open. The plastic seam is clear, so its a clear filter, I've never seen a black one. It looks to be heavily gunked up. A new set of filters and some clean diesel would probably have it running again. (unless it might need glowplugs/battery as well) All in all though, back on the road for under $200 even if all that stuff had to be done. 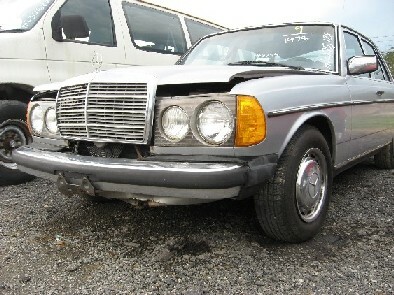 I don't know why they think someone would pay $2200 for a non-running MB. They were asking $3000 when it was running. Maybe enough time sitting would change their mind about the price? It's been listed since winter. I was out riding my bike earlier this evening and saw a sad looking 300SD in someone's driveway....had a bag + ducktape over the passenger front window....and it looked like it had been sitting awhile.... Wonder whats wrong with it....the body still looks pretty nice...probably a mechanical issue. Anything over $600.00 is insane. All the hoses under-hood,Seat covers,vacuum dashpots in the hvac system. steering gear(Tie rods,drag link,shock,Etc. ),Brakes...then start looking at the electro-mechanicals [or vice versa]. Add the seat switch to that long list. I'd agree, 500 would be tops for me. I've bought a lot better for 500. Sounds like some negotiations are in order. Now we here should send Kathy some low balls via email so that our OP can pick it for $1000 or less. To say you bought " better for $500 " , is a bit too bullcrappy to beleive. LEather seats dont wear as well as tex and the rest of the car ( other thant eh windshield) looks fine. BUT to send that along in an email is perfectly fine ! My current 83 SD has 172K on it, starts instantly no blow by at all, and has all service records with it. will not go forward due to transmission problem, but it should be a pretty simple fix. I paid $350 for it. You can believe whatever you want to believe, but these two were $500 cars, and I drove them home. The first one I'm still driving as a DD, the second one I sold to someone and he loves it. I had another one I bought for $550, but I already took the pics off of the site since it's been sold for a few months. Come with me to an auction, and I'll show you some. Here's a pic of one I could have had for $350, and drove home. If it's still there next time, I will. And, we don't have the rust you do up there either. No need to be a hater.